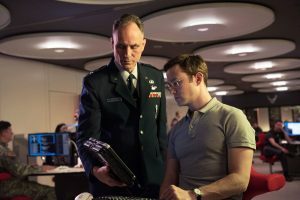 A dramatization of events that occurred between 2004 and 2013, Snowden is a rather inoffensive and by-the-numbers biographical film that mostly plays it straight. It’s at its best when covering the later years, particularly when Snowden (Joseph Gordon-Levitt) is holed up in Hong Kong with The Guardian journalists Glenn Greenwald (Zachary Quinto) and Ewen MacAskill (Tom Wilkinson) as well as documentary filmmaker Laura Poitras (Melissa Leo), as tension runs high in these scenes and makes the film feel like an effective thriller. The story does a solid job at streamlining and communicating Snowden’s history and how he came to do what he did, though it does lean too heavily on his relationship with girlfriend Lindsay Mills (Shailene Woodley) – while the intention here certainly is to humanize him, the scenes they share eventually get tiring because they’re repetitive. Given the greater themes at play, perhaps placing more emphasis on Snowden’s relationships with mentors Corbin O’Brian (Rhys Ifans) and Hank Forrester (Nicolas Cage) would make the story much more compelling and engaging. The same goes for the threats posed by the government practices since they rarely feel scary, though that could be attributed to Stone’s surprisingly restrained approach. The picture benefits greatly from a cast that knows how to make the characters click. Gordon-Levitt delivers a low-key yet extraordinary performance, as he – an actor known for his charisma – plays a character who arguably has none. 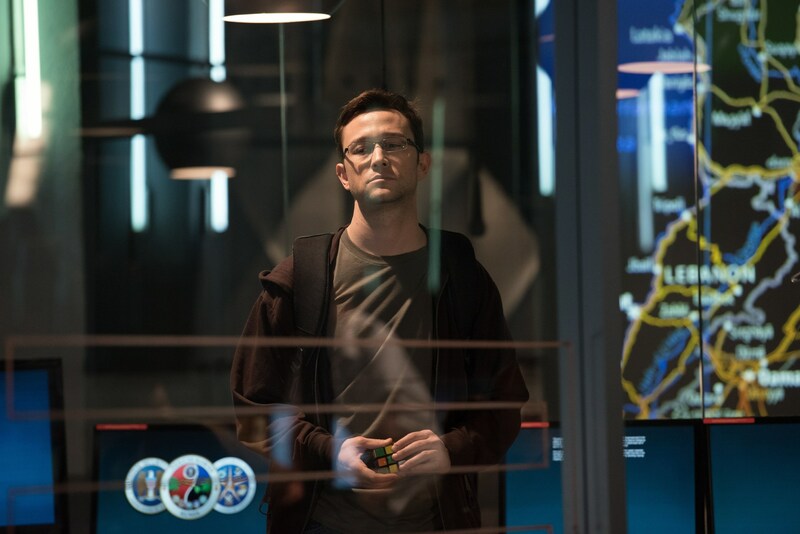 Here, Snowden is an ordinary guy with awkward tendencies, and Gordon-Levitt handily brings him to life, making him quite believable and relatable. Woodley commands her scenes well and shares a nice chemistry with Gordon-Levitt, and because of her efforts, the underwritten Mills is able to breathe. Cage and Ifans are given one-note characters, but by emphasizing qualities such as Forrester’s weary frustration and O’Brian’s cold creepiness, the two serve as efficacious extensions of the film’s themes. The film doesn’t feature Leo, Quinto, and Wilkinson very prominently, but they seize their moments to shine. Ben Schnetzer and Timothy Olyphant drop in as well, and the two of them bring some liveliness to the proceedings. As far as technical craft goes, the film holds up pretty well. Editors Alex Marquez and Lee Percy ensure that it runs at a nice, entertaining pace even though it does feel a bit overlong. Stone gives them plenty of reasons to stay on their toes; they regularly splice in news footage that pertain to the matters at hand, and their work falls in rhythm with the electronic tracks from composer Craig Armstrong’s buzzing score. 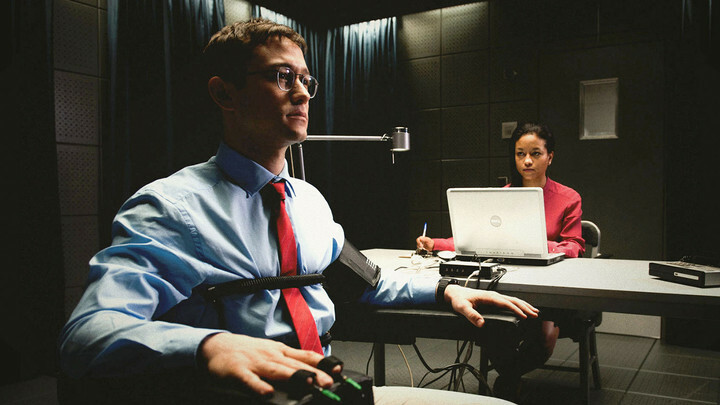 Cinematographer Anthony Dod Mantle elevates production designer Mark Tildesley’s cold, dark interior spaces; the former’s penchant for vibrant images results in some downright visually arresting sequences, with one in particular featuring Snowden in a face-off with O’Brian, whose head is projected to massive proportions on the wall – clearly evoking Big Brother from George Orwell’s famous novel 1984. Really, the only terrible thing here is Peter Gabriel’s too on the nose song “The Veil,” which plays over the closing credits. 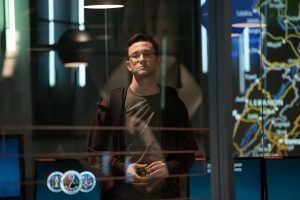 Snowden would probably make for a better film had Stone been more angry about the issues, but for what it is, it’s a solid, serviceable drama. It probably won’t change one’s opinion about Snowden, and it isn’t meant to. Instead, it exists to highlight why he’s a part of today’s conversations and why he will be for quite some time.